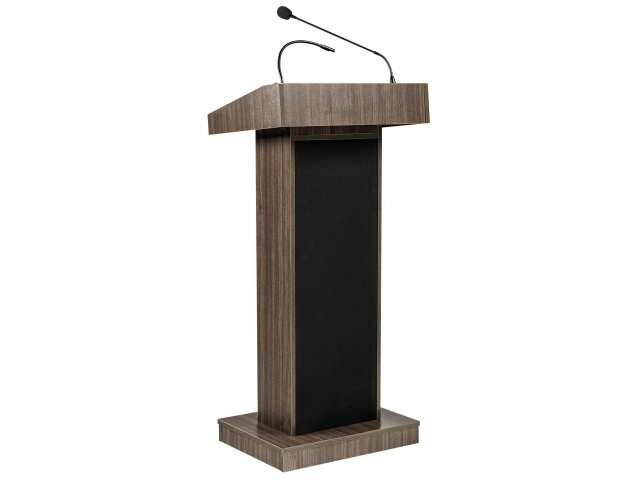 Looking for a sound lectern that comes with a wireless podium mic? This convenient set allows you to choose from three great microphone styles. 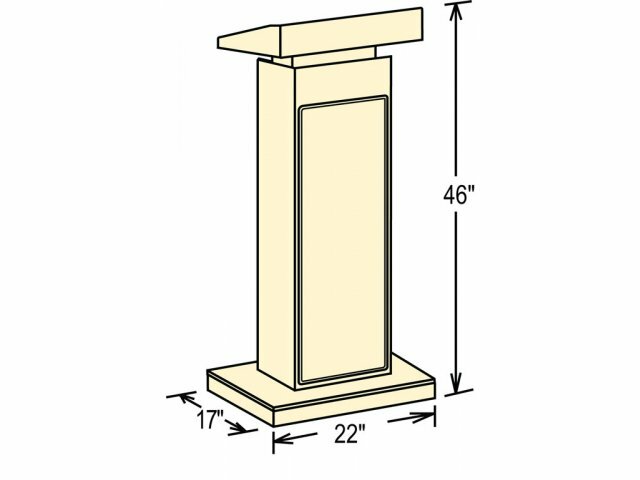 This sound lectern is designed for addressing audiences of up to 2,000. Created to be a base for major presentations, it includes a built-in amplification system and many convenient features. Sound is provided by a forty-watt amplifier and four 6", full-range speakers. It comes fully equipped with AC power cord and a rechargeable battery. A spacious reading surface, brass lamp, and digital clock are important tools that your public speakers will appreciate. Four hidden casters make sure that this permanent looking sound lectern is actually movable. The lectern includes a tie-clip microphone w/ 10' cable, handheld microphone with 9' cable, and your choice of wireless handheld, tie-clip, or headset microphone. 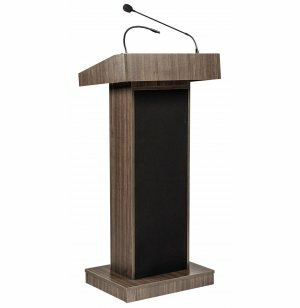 When you want your major presentations to be a hit, use a podium designed to provide support for your distinguished speakers. Multimedia: An Auxiliary 1/8 jack input facilitates playing from all digital sources. Great Sound: A 40-watt amplifier and four 6", full range speakers enable you to reach audiences of up to 2000. Versatile: Amplifier can be plugged-in via AC power cord (included) or used with a 12V DC battery (sold separately). Built-in recharger included. Speakers' Choice: Includes tie-clip and handheld wired microphones, plus one wireless microphone of your choice (handheld, lavalier/tie-clip or headset) . Complete Package: Includes a brass lamp for easy reading and digital clock so you can keep track of time.